The Goizueta Foundation Center (GFC) at Emory University has received LEED Gold certification from the U.S. Green Building Council (USGBC) for its sustainable design and construction. 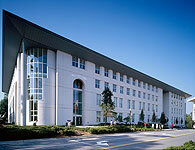 The 101,920-square-foot building is the fifth structure on Emory's campus to receive LEED Gold certification from USGBC. Gold is the second highest certification, following platinum. As one of the most energy efficient buildings on campus, the GFC's low flow fixtures reduce water usage by 20 percent, and energy use by 36 percent. Another water saving method is an underground cistern used to capture storm water and condensate from the air handling unit; that water is reused for irrigation of campus plantings. Emory continues to be a leader in green building practices and protecting its campus green space. Fifty percent of the building material used in constructing the GFC is made from recycled content, and 86 percent of the construction waste was diverted from local landfills. To reduce site disturbance, a protective tree save area was set up where mature existing trees were preserved and additional trees were planted. The GFC was built in 2005 to complement the existing Goizueta Business School, which holds the distinction of being the first academic building in the country to achieve LEED Gold certification of an existing building. The GFC is the classroom and administration building for the business school and houses the Ph.D. program, research centers, executive MBA and modular MBA programs, and faculty and staff. The building includes four tiered classrooms, one flat classroom (a student-centered multi-modal learning environment), a video recording studio and several large meeting rooms. Emory holds the distinction of having one of the largest inventories by square footage of LEED certified building space among campuses in America.